NEW YORK (CNNMoney) -- It's a little ridiculous to have to be writing this story. 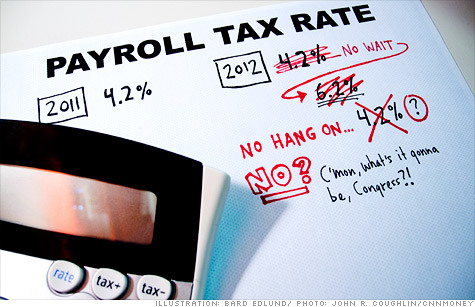 Congress, it seems, is back at Square One in its debate over extending the payroll tax cut. With less than two weeks remaining until a potential tax increase, lawmakers have left 160 million Americans wondering about the size of their paychecks in January. It also has left the people who cut the checks -- the processing companies and in-house payroll personnel -- wondering how to program their systems to ensure they withhold the correct amount of Social Security tax on everyone's first $110,100 in wages next year. Fail to reach agreement: That means the rate would revert to the normal 6.2% on Jan. 1 until further notice. Congress would likely agree to an extension of the 4.2% rate at some point next year and make it retroactive to Jan. 1. For payroll processors, the two-month option because of the $18,350 cap is the toughest to implement. Not impossible, just more complicated and costly to set up quickly, executives from the American Payroll Association and the National Payroll Reporting Consortium told CNNMoney. Many payroll systems may not be able to make all the needed changes in January, the NPRC believes. And some may even struggle to get the job done by February. There are two reasons why: The first pertains to high-income workers -- those who earn more than $110,100 a year. Since many of them will earn more than $18,350 in the first two months of the year, payroll systems will need to be programmed to withhold their Social Security taxes first at 4.2%, then at 6.2% for earnings above the $18,350 limit. The second reason concerns the quarterly forms that payroll processors have to fill out for the IRS. A quarter is three months, but the extension would be for two months. So those forms would need to be redesigned and the systems would need to be programmed to reflect those adjustments. If all that can't be done by March 31, companies may later have to amend their returns. The reason the Senate -- which approved the two-month extension -- opted to apply the 4.2% extension only on $18,350 in January and February is to prevent the highest income workers from benefiting disproportionately from the tax cut. Without the cap, someone who rakes in $110,100 during the first two months of the year would enjoy the 4.2% rate on all of their Social Security taxable wages for the year. By contrast those making $50,000, would only benefit from the cut on less than 20% of their taxable wages. NPRC, the payroll consortium, recommended to lawmakers that it would be easier if they simply decided next year to extend the 4.2% rate and apply it retroactively to Jan. 1. "Virtually all payroll systems are built to self-correct Social Security taxes ... so employers would automatically accommodate a late but retroactive change, automatically refunding to each employee any over-withholding from early 2012 payrolls," NPRC President Pete Isberg said in a letter to House and Senate tax committee leaders this week. In that case workers making $50,000 a year, for instance, would be refunded roughly $83 for every month their Social Security taxes were overwithheld. Indeed, if Congress can't end the payroll tax standoff this week, deciding to do nothing would be the easiest decision for payroll system processors to implement. "Anything that goes past this week would cause a lot of problems for the first checks in January," said Michael O'Toole, senior director of government relations at the American Payroll Association. Any such problems are certainly fixable after they occur. But make no mistake: They are problems created where none existed before because of political brinksmanship and gridlock. Payroll tax cut impact: What if it's not extended?